Thank you, Steve Jobs, for inspiring me so much. I join many of my colleagues in being saddened to hear the news of the death of Steve Jobs last night. Apple, through Jobs' leadership, used disruptive innovation to smash through the complexity of using mobile devices by making the utterly simple to use. For the first time, anyone - young or old - techno-savvy or techno-phobic - could pick up an iPhone and iPad and immediately 'get' how to use it. The massive complexity of the underlying technology was hidden under the covers of a simple and intuitive user interface. The iPhone certainly inspired me to 'see' technology from a non-technologists perspective. The first Tesco-branded iPhone app, Tesco Finder, came from the R&D team as we worked through the (then) unknown process of programming for iPhone and getting it through into Apple's App Store. The app was an instant hit because, we found, many customers could use the simplicity of their iPhone to locate their nearest Tesco - then products in that Tesco branch - using the simplest of taps and swipes of the finger. We could do it because the tools to allow the simplicity of that user-interface were, for the first time, at our command. Now we have the situation where many senior managers and directors in Tesco are using an iPad to do their job. Indeed a few have shunned their laptop in preference for using their iPad! Tesco 'gets' mobile; we are so enthusiastic as a company about the future of this technology on behalf of customers, and the work of Steve Jobs and Apple has had a profoundly positive contribution to that enthusiasm. Thank you, Steve, for being one of the greatest innovators and inspiring me so much. 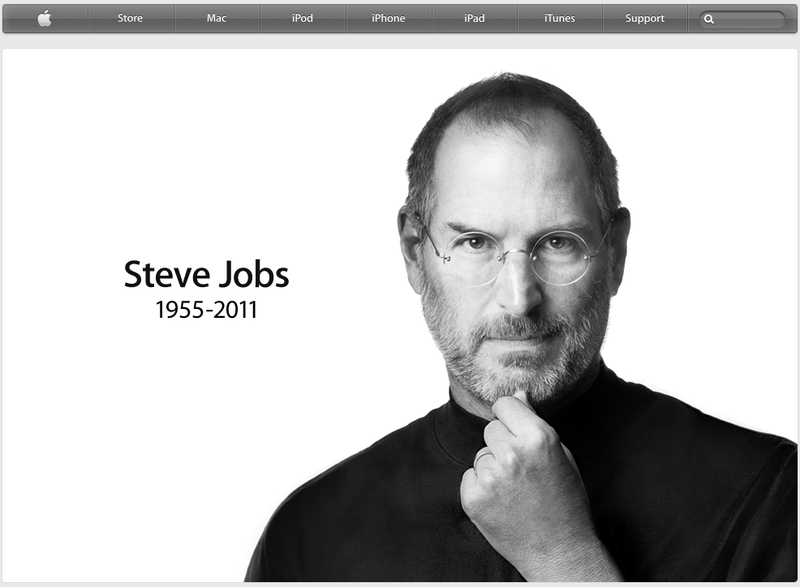 A simple apple.com home page honours Steve Jobs today.